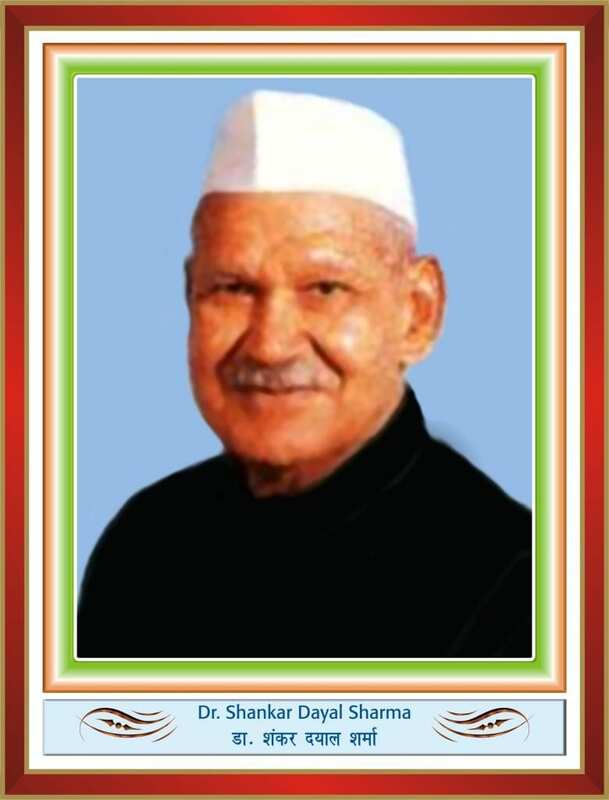 Shankar Dayal Sharma (Hindi: शंकर दयाल शर्मा) (19 August 1918 – 26 December 1999) was the ninth President of India serving from 1992 to 1997. Prior to his presidency, Dr. Sharma had been the 8th Vice President of India under President Ramaswamy Venkatraman. He was also Chief Minister (1952–1956), Cabinet Minister, holding the portfolios of Education, Law, Public Works, Industry and Commerce, National Resources and Separate Revenue (1956–1967) and was thereafter Union Minister for Communications (1974–1977). Dr. Sharma was the President of the Indian National Congress in 1972-1974. Dr. Sharma was born into a Sharma or a Brahmin family from Bhopal. Dr. Sharma received his education at St. John’s College, Agra College, Punjab University, Lucknow University, Fitzwilliam College- Cambridge University. He obtained his Ph.D. in Law at Cambridge. Dr. Sharma was awarded the Chakravarti Gold Medal for Social Service by Lucknow University. Dr. Sharma taught Law at Lucknow University and at Cambridge University. While at Cambridge, Dr. Sharma was Treasurer of the Tagore Society and the Cambridge Majlis. He was taught law at Cambridge University in 1946-47. The University of Cambridge has honoured him with degree of Doctor of Law . Dr. Sharma was married to Smt. Vimala Sharma. During the 1960s Sharma supported Indira Gandhi‘s quest for leadership of the Congress Party. He served in her cabinet as the minister for Communication from 1974-77. In 1971 and 1980 he won a Lok Sabha seat from Bhopal. Later on, he was given a variety of ceremonial posts. In 1984 he began serving as a governor of Indian states, first in Andhra Pradesh. During this time, his daughter Geetanjali Maken and son-in-law: Lalit Maken young member of parliament and a promising political leader,were killed by Sikh militants.In 1985 he left Andhra Pradesh and became governor of Punjab during a time of violence between the Indian government and Sikh militants, many of whom lived in Punjab. He left Punjab in 1986 and took up his final governorship in Maharashtra. He remained governor of that state until 1987 when he was elected for a 5-year term as the eighth Vice-President of India and chairman of the Rajya Sabha. Sharma was known to be a stickler for parliamentary norms. He is known to have broken down in the Rajya Sabha while witnessing the members of the house create a din on a political issue. His grief brought back some order into the proceedings of the house. Presidential election Sharma served as Vice-President until 1992, when he was elected President. After a difficult campaign, he received 66% of the votes in the electoral college, defeating George Swell. During his five-year term, he was active in ceremonial matters and was in charge of dismissing and appointing governors. During his last year as President, it was his responsibility to swear in three prime ministers. He did not run for a second term as President.